Firstly my apologies fellow starship collectors for this comes out of sequence due to a house move and a missing delivery (should be here this week...). So skipping (for now) issues 82 and 83 we arrive at a rare Starfleet coupling. Two issues in one delivery from another two ends of the timeline in Enterprise and the penultimate The Next Generation movie, Insurrection. So first to the NX-Alpha and a ship featured in the episode First Flight. On appearance it's actually a fairly small craft with a slender fuselage and two very abrupt wings carrying the warp two engines. It's also immediately apparent that the design is heavily influenced by the Phoenix which carried Zephram Cochrane into the Star Trek history books especially since the cockpit section of that craft was used to film the forward section of this test vehicle. The nose section is virtually a carbon copy from the Phoenix and that missile structure echo continues as you head back along the body. Eaglemoss have replicated some beautiful detail onto the plastic upper hull section here including that cockpit canopy design and those twin tail fins connected laterally with a strengthening bar/stabiliser. On the underside that plastic twin fin/stabiliser is repeated with the same curve angle but on a slightly bigger scale and the fit and finish on it is perfection. The etched panelling and open engine details on top of the craft add to its experimental, early Starfleet history undertones as does the huge first-stage rocket exhaust that bursts from the rear. Worth noting that the join between the plastic and metal components of the NX-Alpha fit together exceptionally well here and there's little evidence of gaps or any misalignment between the two sections. In fact the join is hidden by that rear fin stabiliser to some extent. The whole underside is forged in metal and continues the detail started on the dorsal section precisely and that's most evident around the raised sections marked out on that nose section. As you get further back the surface detail does lessen significantly on the underbelly but you can still make out the pylon fold lines at least. What is very prominent on the main hull are the understated Starfleet markings (red circle, yellow chevron) and the NX project emblem just behind the cockpit on the starboard side. Microscopic but yet these would have been conspicuous through their absence. Also on both sides of the starboard wing is the Greek "alpha" symbol indicating precisely which of the two ships from the episode this is. Ok; at the end of those strong metal pylons we have the stumpy warp three engines bearing the familiar red bussard collectors to the front and the "golf ball" exhausts to the rear. There is some finer red highlighted edging in place but what does catch the eye are the air bubbles used to give the bussard collectors a bit more definition and depth. Perfectly aligned they are clearly not an accident and bring the early warp engines to life on this great collection addition. The engines even have inset blue venting which you'll have to squint to make out but I can guarantee Eaglemoss have managed to squeeze it in beneath the piping. On first look the NX-Alpha is fairly plain and almost a re-run of the more famous Phoenix we've already added to the collection but spend a few minutes to really get to know here and its the smaller details that make her stand out much in the same way as we saw with the ECS Fortunate in its finishing touches. The stand clip around the warp pylons is a sturdy fit here, holding the NX-Alpha from the rear rather than the mid section although the more central placing over the base works well on the eye. There are a couple of gappy joins around the warp engines towards the rear yet this remains a decent replica to have. 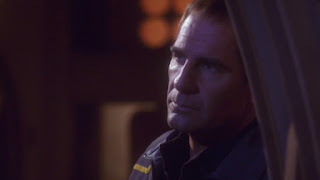 Fans will unquestionably prefer the Phoenix but the inclusion of this craft in the series does mark out a very specific journey from that converted missile through to the warp five Enterprise captained by Jonathan Archer. Issue 84 packs in a lot of backstory here, running us through the whole warp programme from the Phoenix to the warp three flights and then onto Enterprise. The section covers everything from the ship design through to the tests themselves and of course an overview of the episode First Flight as you would well expect. John Eaves' section on the realisation of the Alpha is essential reading as ever and explores a very different path before the issue of money and available, existing sets tightened the reins and made him steer into line with the craft used by Cochrane for his first warp flight. As always Eaves' sketches and thoughts are a delight to experience and understand what could have been had there been more cash on offer. There's also an unusually techie article here on The Road to Warp 5 which offers an impressive insight into the warp scale and precisely how it's supposed to work (if you ignore the bulk of The Original Series) in relation to speed and also in terms of construction materials and techniques. Definitely a great piece for new fans to read and understand some of the deeper parts of the franchise but also a handy bytesize refresher for us more seasoned fans! Next up and jeez, this is a duffer. I could try and big this one up but I fear we may have one of the most disappointing results since records began with the Federation Holoship. It's wonderful that Eaglemoss are packing in the ships from Insurrection and this makes three after the Cousteau Captain's Yacht and the Mission Scoutship but in essence it's a moderately well detailed plastic block. Referred to by the wife as "looking like a remote control", the John Eaves designed Holoship looks impressive on screen especially when cloaked in the Baku lake but sadly that doesn't translate well into a three-dimensional display item. It's not that it's presented badly because there's a good covering of detail from front to back and top to bottom it's just that, well, it feels a bit cheap given that it is two pieces of plastic stuck together. On the upper hull there's a ton of panelling detail, the prominent forward-placed bridge module as well as computer relay blocks and other greebles to break up the otherwise rectangular design. To the front are the reds of the bussard collectors and to the sides two blue lines indicate the locations of the warp engines themselves within the body of the craft. At the back; two yellow lined indents mark out the placement of the impulse engines and flipping her over there's once again a high level of surface panelling to feast your eyes on. Problem is, that's it. No translucent engine sections, no metallic fiddly bits and a recess at the front which steps back to - a blank wall. Admittedly the surface is packed with various levels of plastic BUT it truly is one of the most bland and uninspiring ships in the collection. It might even give the Malon Freighter a run for its money as the worst entry to date. Even the rear-grip stand doesn't help it and instead makes it look even more clumsy than it is. I just hope that including this now wasn't just a knee-jerk reaction because there's been so little from Insurrection and nothing so far from Nemesis. So once you've taken a cursory look over the details of the Holoship it's much more productive to open up issue 85 and get a recap on the craft's part within Insurrection to fool initially the Baku and then later (spoiler!) Ru'afo and the Son'a. There are a couple of new CG images of the flying brick as well as the standard views of the ship. Heck, I can see why there aren't a lot of points to note on those this time round. Closing out the magazine ahead of the standard Key Appearances (Insurrection) is a fitting piece on the screenplay for the ninth Star Trek movie. Given that Sandra Piller has recently had her late husband's book on writing Insurrection published. It's a movie that does come in for its fair amount of criticism but these few brief pages on its evolution do go some way to explaining Michael Piller's decision to take the story in a whole different direction to that posed in First Contact. What a month huh? 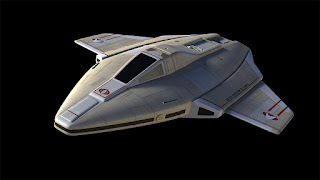 The NX-Alpha is a nice piece, well crafted and presented as has become the norm from Enterprise but the Holoship, despite the design work and efforts of John Eaves, just doesn't hold up. Sorry, it's poor and I was actually lost for words with the latter of this month's issues. End of. Nothing more to see. What's your thoughts on the NX-Alpha and the Holoship? Dayton Ward nailed a superb read with History's Shadow three years ago and the long teased sequel (of sorts) dropped earlier this year with Elusive Salvation. While this does act as a completely separate story to the events of History's Shadow, Ward's newest trek into the unknown returns familiar faces from episodes of The Original Series (Assignment: Earth), Deep Space Nine (Little Green Men) and Enterprise (Carbon Creek) in a tale which is set between the events of The Motion Picture and The Wrath of Khan as well as across the 1970's and 1980's. Placing the action within several different years of human history does mean that you need to keep your wits about you from the first page as we move from moments in the 20th Century to the 22nd Century with fair regularity. Keeping up? Good because there's also a couple of new alien races to drop into the scenario at the same time who are the main reason we're flip flopping around the continuum in the first place. The pace at which Ward keeps us moving around definitely keeps you pinned to the story all the way through and it's a well-warranted sequel after the apparent success of History's Shadow. 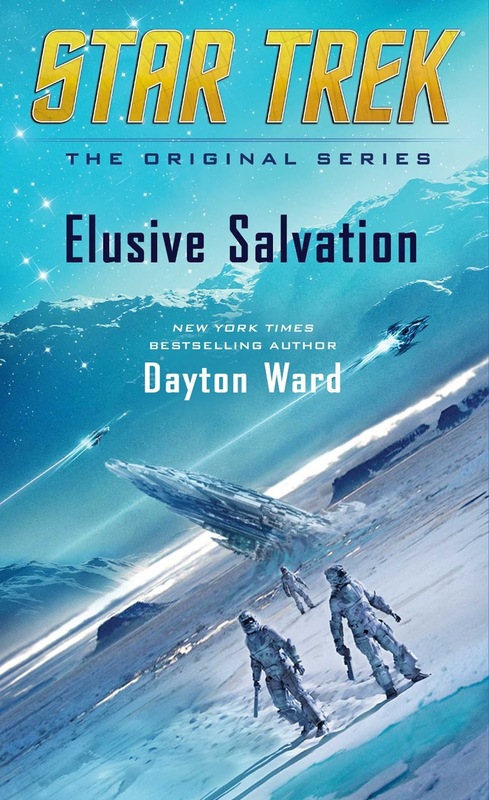 Elusive Salvation is a Star Trek novel that isn't quite a Star Trek novel given that it allows a lot of its guest cast a significant amount of room to breathe and exist. At times it almost comes across that Kirk, Spock and the rest of the regular USS Enterprise crew are there as the guest cast in this adventure which tends to focus more on the characters of Roberta Lincoln and the Vulcan Mestral (Carbon Creek). Elusive Salvation is a refreshing break from adventures on at the final frontier and the edges of the galaxy bringing the action - in a very reboot way - right back to Earth of two time periods. As for characterisation it did feel somewhat light this time round focusing more on the twists and turns of the time travelling protagonists and leaving them with very little to do. 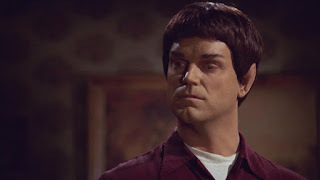 Ok there are a few Kirk quips, an occasional raised Vulcan eyebrow and a cantankerous comment from the good Doctor McCoy but the bulk of the book does rely on Roberta Lincoln for its energy and motivation. For a character who appeared in a single episode of The Original Series, she gets a lot of ground here but very little character depth and at moments I even felt she was coming off a little too much like a female Doctor missing only a TARDIS since the servo she carries is certainly akin to a sonic screwdriver in no uncertain terms. While characterisation might suffer here, Elusive Salvation certainly delivers when it comes to maintaining pace and shovelling out the goods in terms of action and suspense. 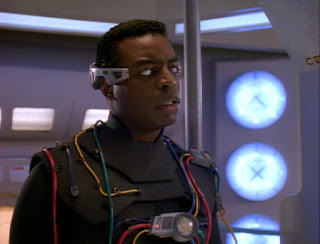 We have the car and mouse hunt for the Iramahl in the 20th Century as well as the observations of Starfleet's finest admirals in Nogura and Morrow in the 23rd Century which are a tad deflated by the sporadic and two dimensional appearance of the Ptaen Hunters who are seeking out the Iramahl survivors. There is a lot happening within this story and some knowledge of the previous tome wouldn't go amiss. Admittedly I haven't read it and did have a furrowed brow at a couple of moments because I wasn't 'in' on past events but don't let this deter you from reading on and enjoy what I must describe as a 'temporal caper'. While not Dayton Ward's finest novel it's still a very worthwhile read and one I enjoyed at every turn. There's even some nice hat tips towards the end that will thrill every fan. Not an essential for your collection but a good 390 page indulgence without question. 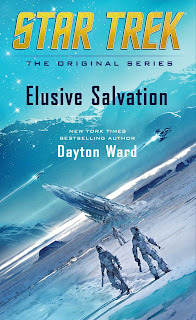 You can also read our chat with author Dayton Ward right HERE! Focusing on everything from The Next Generation onwards, Altman and Gross are back to finish their 50 Year Mission. It's actually a little inaccurate to call this the second 25 years since it actually kicks off in 1986 but don't allow such a minor nit pick put you off because this is one killer book. While the substantial volume one took us from inception through to The Undiscovered Country and thereby a verbal history of the Kirk years, the second - and just as substantial - book explores the spin offs in all their brilliant and sometimes flawed ways. Picard's Enterprise and the four feature films clearly get the largest chunk of the book and rightly so because there's so much to tell and recount. William Shatner's recent Chaos on the Bridge might have unravelled the mess that was the first two seasons but Altman and Gross push even further into the challenges of seasons three through seven, the relentless pace of the show and the unforgiving challenge of maintaining the quality of The Next Generation in its later years. Once again no hold is barred here as everyone from Rick Berman down through the bucketload of constantly changing writers to the steady hands of the main cast are brought into play to explain their experiences for good or bad on the show and it's definitely an eye opening read. Usually these Star Trek histories are all nicey nicey and safely written but given that the authors are using material from decades of interviews, articles and convention appearances it allows a much broader and realistic story to be told. 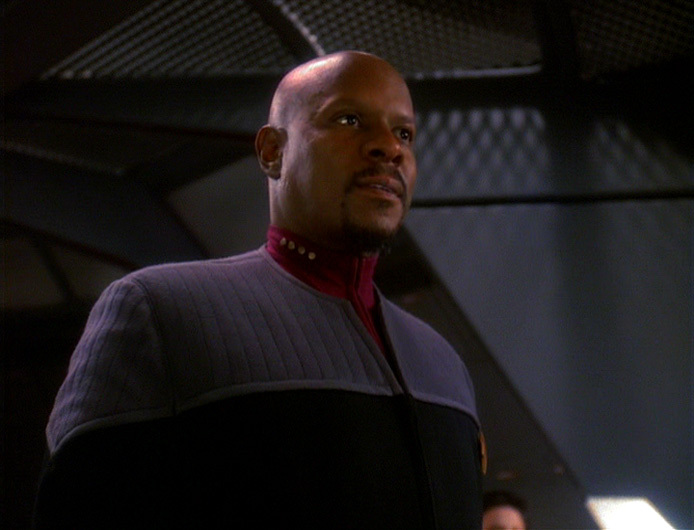 In the case of The Next Generation things generally were a team game on the studio floor while havoc reigned backstage but the real intrigue comes from reading about the three series that followed; Deep Space Nine, Voyager and Enterprise. 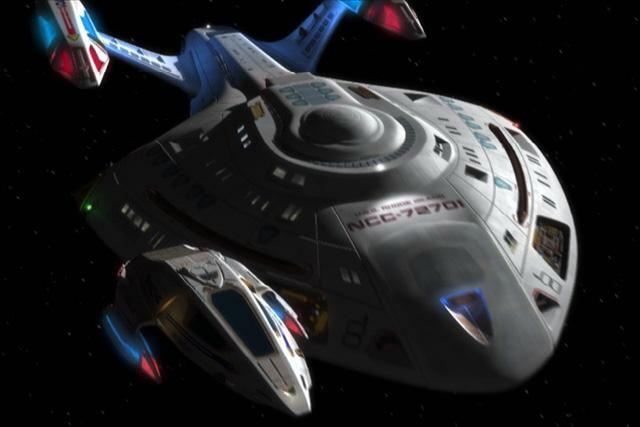 With the space station-based drama it's clear how much cast and producers felt it became the forgotten child while producing some of the most brilliant and groundbreaking episodes of the entire franchise although being allowed to exist in the shadows meant it could do as it pleased for a good proportion of its years especially after the arrival of Voyager in 1995. Most revealing is how the cast of this show actually worked together and related to each other. It wasn't all happiness and joy it seems but that's nothing in comparison to what Altman and Gross cover in their section on Voyager. Truly this feels like a proper warts-and-all history of Star Trek as related by the people who were there at all levels of the production and it provides a much more intimate and at times uncomfortable read. There are certainly comments that will make you watch scenes of Seven and Janeway very differently and you will pay much more attention to any dialogue that Robert Beltran was given as the writing staff became more aware of inherent issues surfacing behind the scenes. Both Deep Space Nine and Voyager get a good share of the book here. Perhaps not as much as I would have liked but it's significantly more pages than they receive in a lot of other publications commemorating the 50th anniversary. Ironically their lack of coverage just backs up exactly what people like Ira Behr say within this very work. It also shows how much of a free reign the "forgotten child" of the franchise was given in comparison to the more controlled/restrained Voyager that was leading the United Paramount Network in 1995. Even Enterprise is given a good deal here with only Phlox actor John Billingsley conspicuously absent from any comments. The final series is served well from Broken Bow up to its cancellation which you do find yourself begrudgingly agreeing with once you've understood the challenges it was already facing during the Xindi arc of season three. Agreeably though there is a lot of praise for the fourth and final season which was helmed by Manny Coto and really attempted to provide an origins series and some of the short-lived shows most memorable episodes. The conversations and relationships that developed during those spin off series are truly fascinating reads as they lurch from close working friendships in some cases through to barely manageable working relationships. The most juicy parts of this oral history though are in fact the parts that you don't know too much about - the in between years from the end of Enterprise's fourth season to the rebooting of the seemingly ailing franchise under the direction of JJ Abrams. It's these lost years, the lost series, the attempted animated web series, J Michael Straczynski's 14 page treatment and all the suggestions stuffed in between which get the pulse pounding - what exactly could have happened if the franchise had taken one of those directions? If that's not enough there's even reflection on the lost novels that would have come out following the 2009 movie but were ditched after being written and edited because they might have jeopardised future movie plot options. Instead we were treated to the graphic novels from IDW which are also covered in skating detail here. Keeping the book confined to short and sharp quotes and memories from key contributors is a massively effective way of retaining your attention over the course of 700 pages of which I read every single damn word it was that entertaining and informative. As this is the 50th, the book does acknowledge the reboot trilogy especially the ease of '09 and the torments of Into Darkness from both an internal and external point of view. This section uses perspective most effectively gleaning a good angle from the production side and viewer side which includes the thoughts of such Star Trek luminaries as Ronald D Moore and Brannon Braga. 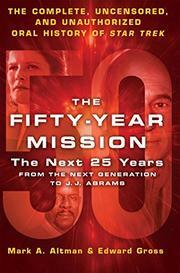 The Fifty Year Mission in both volumes pulls out the stops to provide an intensive reflection on the ups, downs and strife that has affected the show over five decades of success and failure. Splitting it between original Star Trek and the second book focusing just on the spin offs and reboots was a sound call since not everyone will want every aspect but Altman and Gross have to be congratulated for the extensive work that has gone into accumulating all these stories from such a broad spread of individuals across the last 30 years. For note and for those that might think it's out of date before the print has even dried, there is discussion of both Beyond and the "2017 series" although it is not named (in the version I had) as Discovery. Reading quotes from Bryan Fuller in both this and volume one is quite insightful when you consider that he had no idea he would be doing the new series when he was talking about the show over the years! Sadly not an official production but it is as near as dammit as you could get since every word is the viewpoint of someone who has been closely associated with Star Trek since (in the case of volume two) 1986. I cannot recommend this enough to fans of the show. Not only is it a superb read from cover to cover but one of those books that you can slip in and out of with ease. I would stick my neck out and say that these two volumes are the most important Star Trek works to be produced in its fiftieth anniversary year. Top marks. No question. We get through New York and now Ben Robinson goes and hits us with the craft that will take us right up to the centennial issue. 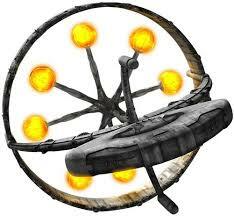 A rare variant; this time a spin on the Nova Class first seen as the USS Equinox in Voyager. This twist is also from Voyager but this time from Endgame and captained by Harry Kim in the alternative future timeline. The biggest visual difference is the "filling in" of the saucer cut-out but I expect there to be a few other minor tweaks in play. Sadly sans the Cobra logo from GI Joe due to copyright issues. The smallest of this latest batch announced and one barely seen except for stills in The First Duty. Nice compact design and continues that recent trend for smaller entries from the franchise. Not massively excited by this one. One we didn't expect in any fashion is this one episode ship from Enterprise. 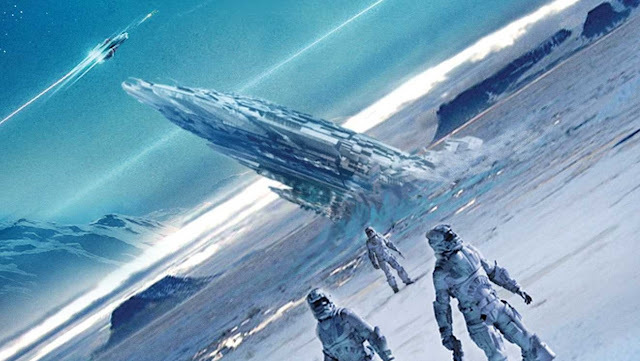 The Borg's means of escaping Earth (aka Arctic One), this is a really unusual addition mixing cybernetic elements with a human vessel. How this is reproduced and given that assimilated feeling will be exciting to see. WOW. Just WOW. I actually asked Ben Robinson at Destination Star Trek just a few hours before the announcement if issue 100 was going to be the USS Discovery and he dismissed that possibility very quickly! It makes a lot of sense that what was the original design for the USS Enterprise would be the centennial issue. It's so simple, so retro but yet hugely significant in the overall picture of the franchise that being issue 100 is the ultimate tip of the hat to Matt Jefferies and everything that came thereafter. As part of the presentation at Destination Star Trek, Ben also revealed more details around the Cheyenne Class and that between 101 and 110 we will be seeing more of the craft from Wolf 359. Larger models of all the Enterprise's are also promised with the Eaglemoss stand displaying the first - the NCC-1701 from The Original Series - which is due in 2017 and is set to cost around £50. New CG has been located for the Enterprise-C and for those of us who grumbled over the Enterprise-E being too compacted, that one can't come soon enough. Could well be we will see big Defiant and Voyager too. Also on display at the event were the upcoming ships from the 90's including the ECS Horizon, the Medusan Starship, the Federation Holoship, Gorn Starship, Romulan Scoutship and the USS Saratoga still bearing the registry of the USS Reliant! I also managed to grab a look at the Designing Starships book. While there is a lot of repeated material from the magazines there are also whole new sections on unseen designs, the shuttles and the Borg which will appeal to any fan. Great times ahead for the Starships Collection with these announcements and great that they've listened to fans who wanted bigger versions of the hero starships. So as the summer blockbuster season ends, it seems that Star Trek has not garnered the appeal of the masses as many had hoped. 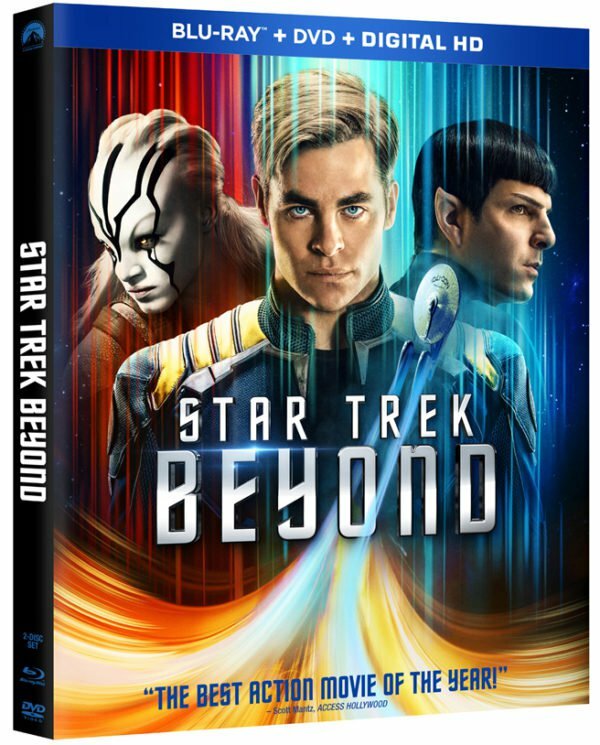 There is no way to sugar coat the fact that Star Trek Beyond was average at best, and in monetary terms has performed very poorly at the global box office. Suicide Squad, Captain America and Finding Dory literally made twice and even three times as much as Beyond. Star Trek (2009) was a spectacular success on Blu-Ray/DVD cashing in more than $200 million in sales. Star Trek into Darkness also performed very well in the home entertainment market, making nearly $85 million of Blu-Ray /DVD/Digital sales. 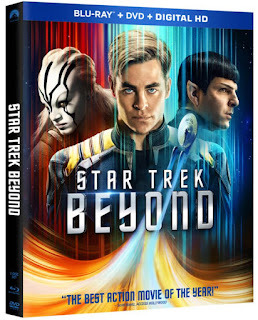 Star Trek Beyond is due for DVD/Blu-Ray release on November 21st but one can only imagine that sales will be lukewarm given that if movie-goers were unwilling to pay for a cinema ticket, it is unlikely a great number will pay to own the movie. So accountancy aside, what does this mean for ‘our’ Star Trek ? 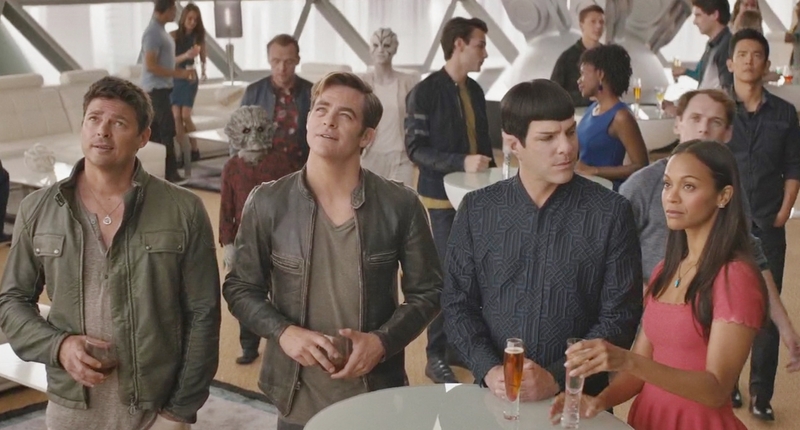 Whether we loved or hated Star Trek Beyond, we all still wanted it to succeed to ensure the future of the franchise in terms of the big screen. As far as Skydance and Paramount are concerned, Star Trek 4 is still officially a ‘go’ but considering Beyond’s poor reception, what approach should they take for this future movie? Is it prudent to go for another large blockbuster event, in an attempt to impress the cinema going masses? Another shot at reaching that elusive ‘wider audience’? Or perhaps this time it would be best to pursue a smaller more intimate story that is completely identifiable as Star Trek and not an event movie. Either way Skydance or Paramount are highly unlikely to attribute such a large budget to any future movie and maybe they will even change direction again ad use a different writer and/or director. There are probably a lot of discussions about this happening right now, for certain; I only wish they would include us fans in these discussions sometimes. 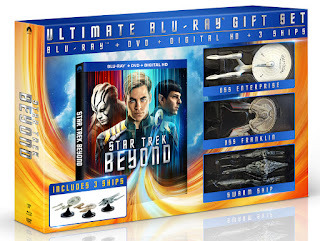 It was the 50th Anniversary, and many had hoped for the ‘ultimate’ Star Trek movie, not a mediocre story with admittedly fantastic visual effects and Justin Lin and Simon Pegg were doing the rounds throughout June this year telling us all that Beyond was a real ‘fan’s movie’. 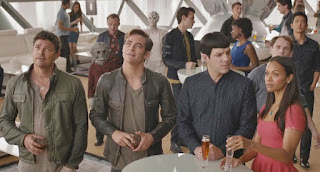 Confidence was so high that it would be a film that really ‘spoke’ to our respective ‘inner Trekkie’ but I feel that what we got was another retread of the nostalgia trip that has already been done better in JJ Abrams' Star Trek (2009). Star Trek Discovery meanwhile has been pushed back and will now air on TV in May 2017, a four month delay. Hopefully this means the production will be more polished and less hurried (the original January airdate did seem a little ambitious considering a single frame had not been shot). A lot of hope now rests in what Star Trek Discovery brings us. Certainly the names associated with the show lend to hopefulness that it will be skilfully made (Kirsten Beyer, Bryan Fuller, Nicholas Meyer, and Alex Kurtzman). Perhaps the delay in the show is indicative of the recognition of Beyond’s lack of appeal, and a sign that changes were made accordingly to ‘fire-up’ new ideas. 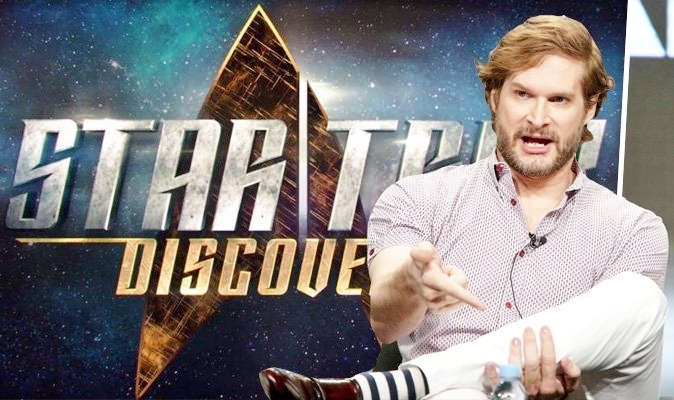 Just recently Bryan Fuller himself revealed that some of the established aliens we know will probably be updated in their physiological appearance. But that first season next year has to survive with good viewing figures and has significant competition from some of the spectacular TV shows offered by the likes of HBO and Netflix. We may love Star Trek, but the challenges it faces are very real and as fans, we have to ardently support its future, not argue between ourselves about petty details and minutiae. The events surrounding a certain crowdfunded project and the divisions it caused were disturbing and have maybe damaged Star Trek’s future. I hope like everyone that Star Trek Discovery is amazing, despite some complaints that it is another ‘historical’ story. We have to move forward as fans also, go boldly if you will and rally our support for ‘our’ Star Trek. Bryan Fuller et al, it’s over to you!